Did you know that I have a You Tube Channel, Skip Allen? I do. I do a fair amount videos on the channel that do not get to the blog. My last blog post was December 31, 2013. Since then I have posted six videos on You Tube. Usually they are short videos about a specific subject, a quick tip. Frequently, they are in response to a question I have seen on a forum. If you like my blog, I think you will like my You Tube Channel. Here are the six videos posted on You Tube since December 31. Review them and if you like them, do subscribe to my blog. 1. This first video talks about brush density in Watercolor Variants. I was attempting to answer Painter Factory question. 2. The second video continues talking about brush density, but this time in Digital Watercolor variants. 3. The next video, as the first two, is in response to a question at Painter Factory. It was short and I didn’t add the question to the video, so I restricted it to viewers of the thread at Painter Factory. Later, I decided to open it to the public. Hope you enjoy it. 4. I had fun with this one. To answer a question, I usually have to do some research and test various functions in Painter. In other words, to answer the question requires that I learn new stuff in Painter. It is a win win situation. In the video I learn how to make a grainy eraser using a layer mask. 5. The fifth one was another learning experience for me. I seldom auto-paint, and I don’t remember ever trying to auto-paint with watercolors in Painter. But that is where the question led me. 6. The most recent video posted I have wanted to do for some time. I think it is the most frequently asked question from Painter users. Why doesn’t my brush paint on a layer? Sound familiar? I’m sure you have seen this question pop up multiple times. I hope folks will be able to use this video to answer the question about brushes and layers. OK, there you have it. The six videos posted on my You Tube Channel since my last blog post. If you like them, do subscribe to the You Tube Channel of Skip Allen. I was looking through a folder where I save test or experimental images and noticed an image of a Rose that I cloned from a beautiful photograph by Melissa Gallo.…thank you Melissa for allowing me to use your photograph. I didn’t mean to finish this image; it is just a test piece. I was testing a cloner brush, and I discovered what I needed to know and stopped working on the image. As you can see, the image is a bit rough, but interesting I think. I wondered if I could do something to the image that would complete it. I decided to video the process and share with you. In the first video, I duplicated the canvas layer and changed the composite method to gel. Gel composite method is transparent and over the canvas layer it tends to darken the image and add richness to the colors, but the values darken. Using a layer mask, I show how to reclaim some of the lighter values. In video two I use Adjust Colors from the Effects Menu. This function allows you to change hue, saturation, and value similar to the way the Underpainting Panel works. But Adjust Colors has an extra powerful feature; it can use Uniform Color, Paper, Image Luminance, or Original Luminance as guides. Using Image Luminance is my favorite way to use Adjust Colors. Adjust colors is global, unless you use a selection and then only the area within the selection changes. The image after video 2. Notice the subtle color changes? Another great function under the Effects Menu is Adjust Selected Colors. It is different from Adjust Colors because you can select a single color or range of colors to change…it isn’t global. And, like Adjust Colors you can constrain the changes to within a selection, which I did not demonstrate. Video 3 will show you how to use Adjust Selected Colors. In the last video, I use Stroke Attributes, which is a brushes function. Not all brushes can use Stroke Attributes, but the most can. It is like painting with composite methods constrained to the brush stroke instead of covering the layer. It is a little difficult to explain verbally, but easy to explain in a video and very easy to use. After doing this video, I believe Stroke Attributes is a technique that fits well into the cloning workflow. Check out the last video. I think I said somewhere in one of the videos that when demonstrating I some of the time overwork an image or don’t notice a flaw. As I was posting this image, I realized that I should have reduced the scale of the Artist Canvas paper. It doesn’t look right at the present scale…so if you try these techniques…do check your scale setting on your paper to see if it looks correct with the size of your image. OK, I guess that’s it for this post. Thanks again to Melissa Gallo for allowing me to use her wonderful photograph. Check out her site; you will be glad that you did. I want to thank all you for visiting my blog this year. I want to especially thank folks who have thought enough of the blog to donate; I appreciate you more than you know. You encourage me to keep blogging. I wish you all good health, good fun, prosperity, peace and happiness in the coming year. Happy, Happy New Year!!! I have made a new brush set called HOS 2013 Florals for Painter X3. PLEASE NOTE: These brushes are for Painter X3 only; do not try to install in any other version of Painter. I had planned to introduce the brushes to the blog first, but I was having so much fun with them, I decided to introduce them in the Holiday Open Studio class at the Digital Art Academy, which is why I named them, HOS 2013 Florals. HOS stands for Holiday Open Studio. Anyway, I am making them available here, too, plus I have added 10 videos showing how I use some of the brushes to create this painting. I hope you enjoy the videos. I tried to make them around 5 minutes long, but toward the end, I did get a bit verbose. In the first video, I set up the paper layer and added a beautiful painting by Monet to the mixer pad, which allows me to use the color scheme of Monet’s painting. I create a simple sketch in the second video. Next, I create the background. Here is video 3. In video 5 I show the use of a layer mask. I create another layer mask in video 6. In both video 5 and 6 I use a new brush called Channel Painter. In video 7 I use a new brush called Dark Edged Wash. I brought back several older favorite brushes and added them to this category. Thick and Thin 17 from Cool Springs is an example. I use a layer command called Lift Canvas to Watercolor Layer in the eighth video. This command is a must for working in watercolor in Painter. Finally, I bet you are tired of waiting, I use Flower Maker and Flower Painter; the two flower brushes included in HOS 2013 Florals. And, guess what? You find out that it was the paper making the flowers all along. The tenth video shows finishing touches. I hope you enjoyed the series. There are three downloads for this post; the brushes, the suminagashi papers, and a flow map library. I didn’t use a flow map in this demonstration, but several of the brushes can use flow maps. I would use the Paint Jam 2 Flow maps provided in a earlier post. The suminagashi papers would not have been possible without David Gell’s wonderful Suminagashi 2 Brushes. David has a new site devoted to Painter X3 called Jitter Brush – X3 and Beyond. 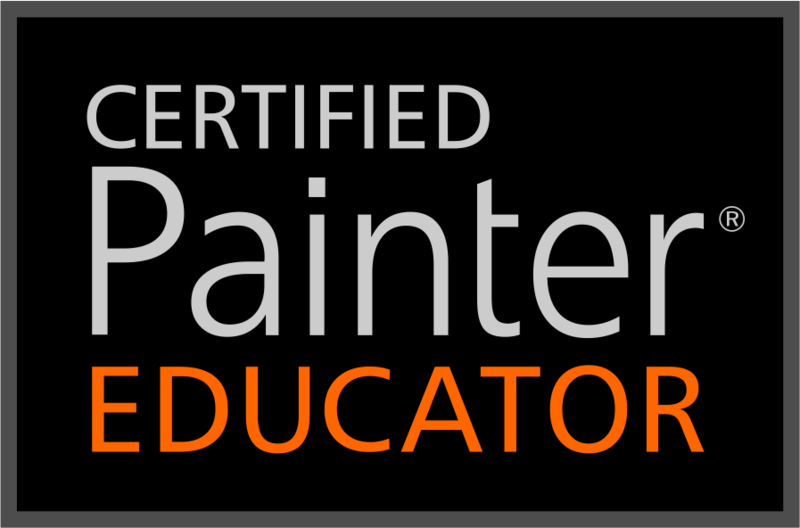 Thank you David for all that you do for the Painter Community. I have learned more about brushes from you than anyone else. OK friends, I think that about covers it for this post. Enjoy and I hope each and every one of you have a Happy Holiday and a fabulous New Year. A student asked an interesting question in my class, Discover What’s New In Corel Painter X3. Registration for this session closed Friday evening, but the class will be offered again in a few weeks. We know that with Corel Painter X3, we have enhanced clone features including a Clone Source Image. We can manipulate the image in multiple ways and then save it as a new clone source, or update the current clone source, or simply discard it. I thought you could do almost anything to the Source Image; you can. Just check out this video. Tony from Australia asked if we could bring in a clone source that is smaller than the original source and place it in the source image perfectly aligned. I tried it and at first I thought it couldn’t be done, but as I played, I realized that it could be easily done. Check out the video. I cloned the following image in Corel Painter X3. Hope this video was interesting and it gives you some ideas for cloning in Corel Painter X3.